Tonight was the last of our Wednesday night Eucharists and Suppers. St. Patrick's in West Monroe hosted with the Rev'd Robert Dandridge presiding. The Rev'd Dr. Frank W. Hughes, interim priest at Grace preached. St. Patrick served a wonderful meal too. The decoration were all green for the church's patron, St. Patrick. All the Episcopal Churches, St. Thomas', St.Patrick's, Grace and St. Alban's and Messiah Lutheran have really turned out for these evening events with around ninety attending each time. 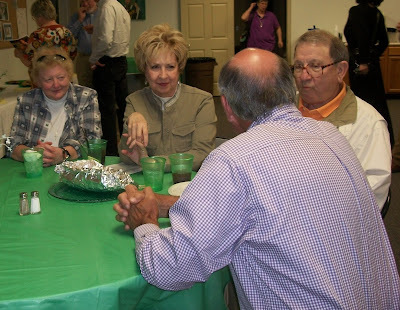 Pictured here are some of the folks from St. Alban's at supper.